← Wish us luck at the WI State Fair! Historically, Ellis Island, located off the southern tip of New York is a symbol of American immigration. Millions of immigrants came to the U.S. through this “gateway to the new world,” and this dessert is an homage to all of the people who make up this melting pot of a nation. Allow us to explain…this New York style cheesecake is served with a sauce made from Great Lakes Distillery’s Kirschwasser, a German-style cherry brandy, that is distilled from a Von Stiehl produced cherry wine. This wine is made from the montmorency (historically French) and balaton (historically Hungarian) cherry varieties grown in Door County, WI. That’s what we do here at Cream City Cuisine, we bring people together…even if it’s in dessert form. For crust: Crush 1/2 box chocolate graham crackers until you have a fine grain. Melt 1 stick of butter in microwave, and mix together with graham cracker crumbs until equally covered. Mix in 1/4 cup sugar. Press into bottom of 10 inch Springform pan and bake at 350 F for 10 minutes. 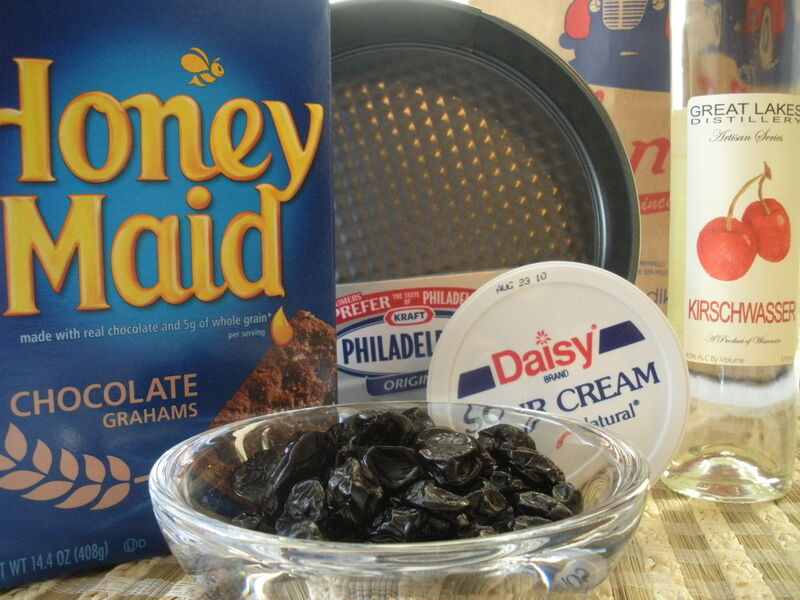 For cheesecake: In large bowl beat softened cream cheese and 1/2 cup sugar until mixed. Beat in eggs, vanilla, and 2-3 tbsp. of corn starch just until fully incorporated. Stir in sour cream and blend until well mixed. Pour on top of crust and bake at 350 F for 45 minutes. For sauce: Bring water, 1/2 cup sugar, Kirschwasser, 2 tbsp. cornstarch, and nutmeg to boil in a saucepan. Continue boiling for 5 minutes, and then remove from heat. Stir in butter, vanilla, and dried cherries. Stir until incorporated. To serve: Cut cheesecake into slices, plate and spoon sauce over top. This entry was posted in Desserts and tagged Great Lakes Distillery. Bookmark the permalink.